More than just a routine, enjoying a break is a way of life in Italy. The idea of sipping coffee and savouring a meal is a cherished tradition that has now found its way to the city. Opening this past spring at Jane and Rutherford’s bustling intersection, Zona Caffè is a unique hot spot, offering more than your average hot table and bar. “We wanted to create a place where friendships are made as you come to unwind,” says owner and founder Lina DeRocchis. 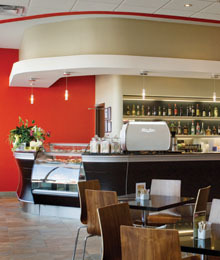 “It has a very modern design and European feel – all of our equipment is imported from Italy.” Walking into Zona Caffè, patrons instantly notice the cool, soothing décor, infused with aromas of authentic Italian food. With experience operating cafés, bars and bakeries for over 20 years, Lina’s husband, Silvano, lends a hand when escaping his own business. “The interaction with people is what I enjoy the most,” he says. “Over the years I’ve developed great pride in serving patrons, which has led to lasting friendships.” The family owned-and-operated business produces some of the most delicious, casareccia-style dishes and desserts. “One thing people tell us is that our coffees – espressos, cappuccinos and lattes – are among the best they’ve tried,” Lina says, pointing out that her Victoria Arduino espresso machine is one of the first in Canada. 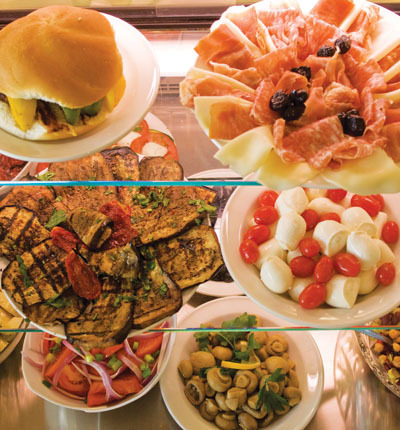 Guests come to Zona Caffè to enjoy everything from an early breakfast, hot lunch, and evening dessert, along with special functions and private catering.